This was a day for record-breaking. Not just one, but three (3), Keiths turned up to play; Letchworth fielded a team worthy of the Mary Rose level play competition, with handicaps of 1,2,2½ & 3; we didn’t lose the first game of the season; and we finished with a high tea worthy of a Fun Doubles afternoon. Players were Terry Mahoney, Philip Windred, Keith Rhodes & George Woolhouse. It is normal to start with a quick bit about the croquet: the morning doubles were shared one apiece on a cool morning that gradually warmed up. Afternoon singles were notable for the forest of bisques lined up against each of the Letchworth players, two of whom won and two of whom just lost. It all went down to the last shots of the last game, which seems to happen too often for comfort these days, during which time tea appeared – enough to distract anyone. Anyway, on to the main event . . .
Why more people don’t put their names down to play in this league is beyond me ! If your handicap is anything above 3 we urgently need you on the team, ideally with a pile of bisques in front of you to frighten your opponents. Letchworth opened the season in style with a 17-1 win over Chelmsford in the East Anglia GC Level Play league. The teams: Letchworth: John NOBLE, David TUTT, John SKINGSLEY, Peter ROSS; and, Chelmsford: Paul BRIDGMAN, John SKUSE, Tony FREWIN, Robert JONES. TUTT and SKINGSLEY - fresh from their recent success for Hertfordshire in the Wheeler Shield - polished off their doubles game in no time at all, while NOBLE and ROSS seemed to make heavy weather of theirs, taking until the 13th hoop to win a scrappy game. The rest of the day, however, went more smoothly and saw Letchworth score 122 hoops to Chelmsford’s 71. On paper this is probably the easiest game Letchworth are likely to face this season, but it was a very strong performance from all players and a great way to start to the season nonetheless. The next match will be more of a test: away to Watford on 6 July. A very pleasant match played in good spirit but, unfortunately, the Reds could only manage a draw against a strong Meldreth team, playing their first year in the Handicap League. As there is only one lawn at Meldreth the match was played in the form of one Doubles and 9 singles games. The Doubles pair (Peter Ross and Robert Staddon) carried the Doubles but, thereafter, the full team could only manage another 4 wins between them. Letchworth member, Robert Skeen, was playing for his home club Meldreth and proved an invincible opponent winning all 3 of his games. The afternoon was rounded off with a yummy afternoon tea with a tasty array of homemade cakes. Red Team: Peter Ross (2), Robert Staddon (5), Tracy Martin (8). 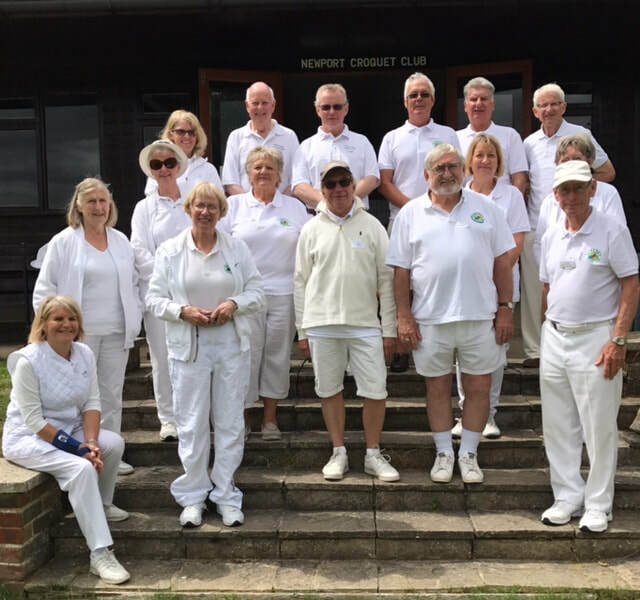 It was a pleasure to welcome the Elms to Letchworth again and we had a great day of croquet played in a friendly spirit. The day kicked off with one win for each team in the Doubles round; by lunch it was 6 - 4 to the Reds; the afternoon was even-stevens with 4 games each. It was so nearly another drawn match for the Reds, saved by David Clancey pulling off a win at the golden hoop in the last round to secure a home win. Elms Team: Tim Ham (6), Colin Carr (6), Peter Cowper (8), Sally Carr (9). Enfield (W) v Reds. 5 July Result 12-6. On a seriously hot day at Enfield Bush Hill Park, on the newly cut Enfield grass, the Reds struggled in the heat to get to grips with the very fast and capricious courts – unfortunately, very unsuccessfully!! We started off badly, losing both of our Doubles and, by lunchtime, only David and Tracy had won a singles game (score 8-2). After a strong pep talk during the break, Captain Tracy rallied her troops and the post-lunch games went somewhat better, Reds winning 4 of the 8, two others lost on the golden hoop - bringing the final result to 12-6 to Enfield. The Blue team had a good day at Newport when they won both of the doubles matches and then went on to halve the singles so that the final score was Letchworth Blues 10 & Newport Elms 8. The star player was Stuart Haggett who won all four of his singles as well as partnering Peter Aspinall in winning their doubles match. It was a very hot day but thoroughly enjoyable and Newport were excellent hosts. Not our best match – Meldreth were in sparkling form and routed the Blues by 13 games to 5 games. The morning session belonged to Meldreth who won all the matches but in the pouring rain after lunch the Blues won five out of the eight games. 6 July 2017 - Letchworth lost to Watford 8 – 10. An excellent performance by Letchworth (John NOBLE, John SKINGSLEY, Peter ROSS and Ian MANTLE) in a very close, hard fought match, against a team stronger on paper and playing on their home ground. Letchworth: John NOBLE, John SKINGSLEY, Peter ROSS and Ian MANTLE (aggregate handicap 7). Watford: Nick ARCHER, Geoff JOHNSON, Simon HATHRELL, John BEE (aggregate handicap 4). The match was neck and neck from start to finish. Indeed, each game was close, with many going the full distance. For most of the day a draw looked the likely outcome as the scores moved slowly forward round by round: 1-1, 3-3, 5-5, 7-7. The final hoop count was 103 - 101. It could hardly have been closer. For me, the two deciding factors were: Watford made fewer unforced errors; and, Simon HATRELL, who was clearly the player of the day – his AC expertise shone through and he deservedly won all his matches. The four Letchworth players played outstandingly well and their performance against a strong side on fast and “unpredictable” lawns bodes well for the rest of the season. 8 July 2017 – Letchworth beat Northampton 11-7 in their second home match of the season. Letchworth’s John NOBLE, David TUTT, Jeremy SCOTT and Ian MANTLE all played exceptionally well to beat a Northampton side fractionally stronger on paper, and bolstered by the knowledge of being the current trophy-holders (Northampton: Pete DOWD, Les HEARD, Peter STANSFIELD and Richard CAIN). The match started well for the home team with the doubles games being halved 1-1, and then winning all four opening singles in which each competitor plays his ranked counterpart: the score 5-1 at the end of round 2. Northampton fought hard throughout but had a mountain to climb even at this early stage. Taking lunch with the score on 7-3 presented challenges for both sides. Crucially, the home players held their nerve and halved each of the remaining rounds to win by a convincing margin 11-7 (107-90 hoops; two of the losses were 6-7). It was a highly competitive match with many close games. The standard of play was high, with Letchworth making fewer mistakes than in the previous match just two days earlier. It was played in a good spirit and everyone seemed to enjoy themselves: indeed, it’s hard not to when playing good croquet on excellent lawns and in bright July weather. David TUTT was the man of the match winning all four of his singles. His inexorable march to a handicap of -1 continues unabated. Last Tuesday, 18th July, we played a League match against Wrest Park. It started well, when 5 members of the team of 4 arrived, due to a communication mix-up. In the end, three of us played two matches, and the other two one each. Despite the recent weather, the lawns were playing very well, and showing some benefit from the recent rain. It was a lovely warm sunny day, needing a liberal application of sun cream. In the event, we did not have one of our better days, and lost 1-5, losing both doubles (admittedly one of them by 1 on time after sudden death), and then three of the singles. At least, we had a good view of the red kite and the buzzard circling overhead. Win for GC Level Play Team 22 July 2017 – Letchworth beat Leighton Linslade 14-4 in their final home match of the season. Another excellent all-round performance from Letchworth’s John NOBLE, David TUTT, Peter ROSS and Jeremy SCOTT who were too much for Leighton’s David BALL, John THORP, Ross BAGNI and Judith PENGELLY. Indeed, the match looked like being even more one-sided when we sat down to a lunch break at the end of round three 9-1 up. The breaks were kept short to try and get as much play as possible before the inevitable downpour, which duly arrived mid-way through the final games. Those who started on primary colours were thankful, those following on with secondary colours were not put off, however. In a fitting end to the day Jeremy SCOTT just pipped Leighton’s top seed, David BALL, 7-6. And, yes, David TUTT now has a handicap of -1; well-deserved too as he has consistently been the strongest player. Next and final match: Enfield, away, on 2 August. On a day of continuous drizzle, on our lovely lush green lawns, the Reds enjoyed hosting the very amiable Enfield (S) team. However, we started badly by losing both the doubles and followed that up by losing all 4 of the first round of singles. Stepping up a gear, David and Tracy each won a game in round 2. Would a miracle happen and would we pull it back?? NO!! Despite valiant efforts and several golden hoops, the team managed only 5 wins over the next 8 games - a good average but not enough to make up for earlier disappointments. David Clancey was, once again, our Best Player winning 3 singles, Tracy 2, Graham and Trish one apiece. Enfield (S) Team: Henry Hobbs (4), Andrew Fall (7), David Barnicote (7), Frances Broadway (8). 2 August 2017 – In their final match of the season Letchworth beat Enfield 12-6. Another excellent all-round performance from Letchworth’s John NOBLE, David TUTT, John SKINGSLEY and Jeremy SCOTT who were too much for Enfield’s David FROST, Ken PICKETT, John STREET and Brian DAWES even on their “indifferent” home lawns. Enfield struggles to get in to the match and the result looked inevitable almost from the outset: 5-1 after round 2. Enfield rallied in the later rounds, but Letchworth’s strength in depth meant that there were no easy games. Only David FROST, who won three games, prevented a landslide. For Letchworth, on this occasion, it was Jeremy SCOTT’s turn to secure the few index points needed to cut his handicap. The win puts Letchworth at the top of the league – for now – but other clubs have yet to complete their matches. Whether the great results this year prove enough to secure a place in the final will depend on how well others finish their season, particularly Watford, the only side to beat Letchworth. But whatever happens, Letchworth has had one of its best runs for some time and those who have contributed should be proud of their performances. Final placing may not be known until late September. The Blues played their final game in a constant downpour of rain at Enfield, the team of Jeremy Scott, Hugo Jeune, Peter Aspinall & Colin Gregory braved the elements and after the first game one of the lawns had to be abandoned as it was waterlogged. Play continued on the other two lawns and eventually after all the games had been played the result was a draw with each team achieving nine wins. The result meant that Enfield South would become league champions so the Blues could be proud that they held them to a draw. As usual Enfield were good hosts providing a constant supply of hot drinks but the team was relieved to be on their way home to be fortified with a hot bath and whisky!!! Another match, another draw! The Reds have certainly not been at their best this year but, all things considered, we have had a very enjoyable time. Newport is always a club we enjoy playing at and this time was no different – lovely lawns, lovely people. Play was very much even-stevens all the way through – the Doubles were one apiece and for the first two rounds of singles each team won two, lost two. Round 3 was slightly different as the Reds won 3 and lost only 1 – it looked like we might actually manage a win!! But NO – Round 4 was win 1, lose 3 so we were back where we started – a draw at 9 games each, although the Oaks did score 4 more hoops overall than us (104 – 100). Sue and Tracy were both in good form, each winning 3 of their 4 singles games – Sue was Man of the Match as she also won her Doubles (partnered by David). A good time was had by all and a generous choice of homemade cakes was produced with tea – perfect !